A special warranty deed, with limited warranty covenants, can be used to convey title to real estate in Connecticut. This form must meet the statutory requirements for a conveyance of real estate in Connecticut. 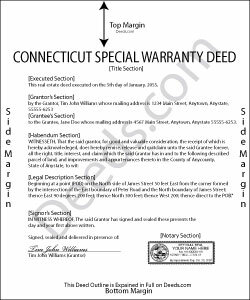 The Connecticut General Statutes do not specifically address special warranty deeds by name. However, section 47-36c provides statutory forms for conveyances and also states that "nothing in this chapter precludes the use of any other legal form of deed or mortgage." A duly executed special warranty deed should contain the following covenants of warranty: (1) that at the time of delivery of the deed, the grantor is lawfully seized in fee simple of the granted premises, (2) that the granted premises are free from all encumbrances, except as set forth in the deed, (3) that the grantor has good right, full power, and lawful authority to convey the same to the grantee, and (4) that the grantor and his heirs, executors and administrators will warrant and defend the granted premises to the grantee and his assigns forever against the claims and demands of all persons claiming or to claim by, through, or under the grantor. A special warranty deed must be signed and acknowledged by the grantor. The grantor's signature must be acknowledged by two witnesses who are not otherwise involved in the transaction. The notary taking acknowledgments can be one of the witnesses (47-5). Acknowledgments of deeds in Connecticut may be made before a judge of a court of record, a clerk or commissioner of the Superior Court, a justice of the peace, a notary public, or a town clerk (47-5a). Out of state acknowledgments will be valid in Connecticut if the deed has been executed and acknowledged according to the laws of such state where acknowledgments were taken and before one of the officers listed in 47-5a. Connecticut does not authorize county recording. Deeds and other land records are recorded in the office of a city or town clerk in the city or town where the property is located. A special warranty deed will not be effective to hold any land against anyone other than the grantor and his heirs unless it is properly recorded. The first recorded deed will have priority over later recording for the same real estate. Once a special warranty deed is delivered to the grantee, the conveyance is effective as against the world, provided that it is recorded within a reasonable time period following the delivery (47-10). The purpose of Connecticut's recording statute is to protect later purchasers for value against a prior unrecorded deed.